On this Christmas Eve, let’s remember one simple truth. When Jesus was born as a baby in that manger -- for the first time, God was with us! Literally. When my sisters and I were young girls and Christmas was approaching, we would lay on our beds and talk about how cool and amazing it was that God became a human being and walked on the planet He made. Just the idea that God Almighty would choose to become a baby who grew up and walked on the planet that He created would just boggle our minds! It’s a thought beyond human understanding. Have you thought about it lately? God was here -- on Planet Earth! Jesus was God in the flesh. While He was fully the Creator of the universe, He humbled Himself and became a man so that He could save us! God walked among us. He was here with us. >>The sad thing is that many people in that day completely missed His visit! Let’s not make that same mistake. >>Let’s not miss His visitation in our own lives today, this holiday season and as we head into 2019. Today, Jesus is alive and very much with us, now! Jesus is our Immanuel. Let’s keep this in our hearts and minds in all the hustle and bustle of Christmas, last-minute shopping and Christmas Eve celebrations with family. Take some time today to acknowledge, thank and talk to Jesus -- your Immanuel -- God with you! He loves you, He’s for you, and He’s WITH you! Today, let’s have a heart-to-heart chat about leaders. Grab your pumpkin spice latte, get comfy and let’s talk for a few minutes! Each of us has leaders in our lives...maybe it’s at work, or church or school. People like our parents, pastors, government officials, teachers, our boss and so on. If we’re not careful, we may -- sometimes without realizing it -- put them on pedestals. Often, that starts from a very genuine place of loving and esteeming that leader. You think so highly of them -- they’re just the best leaders, superstars, incredible people! However, what each of us will come to see at some point or another is that every leader is just a normal person too! They’re average joes, or average janes, just like the rest of us. YES...they’ve been anointed to lead in the roles they’re called to...but they’re also human. They have to lace up their faith boots and walk through life one day at a time, just like the rest of us. >>Can you see now how placing them on a pedestal, whether intentionally or unintentionally, is bound to lead to some issues? Friends, you will eventually see the “human” side of your amazing leaders...and if they’ve been put on a pedestal in your heart, that is going to cause them to fall from the pedestal. That could then get you caught up in disappointment, discouragement or even worse...you could get stuck in the trap of being offended. This type of situation is lurking behind untold numbers of church splits, company splits, family feuds and divisions of all kinds. When it comes to your parents or civic leaders the Bible has a lot to say about honoring and obeying them. (We’ll save that for another devo.) God’s Word also has a lot to say about the benefit to YOU, when you honor the spiritual leaders He has placed in your life. I encourage you today to look at this idea of honor from a few angles. (Hint: It will benefit both you and your leaders!) Absolutely we should esteem, value and love the leaders that God has put in our lives and on our hearts. But esteem the call on their life -- place the high value on the anointing they’ve been given by the Lord. Can you see that shift in focus? You’re not putting the person on a pedestal...instead, you’re choosing to focus on and esteem the position and calling. In 1 Thessalonians 5:13 we are encouraged to: “...esteem them very highly in love for their work’s sake” (NKJV). That can seem like a very simple, or basic, shift in focus -- but it will make a huge difference! Your leaders will feel your support of their role without sensing the pressure to be perfect or super-human. That will help make leadership a joyful experience! I love this verse in Hebrews 13:17, which shows so clearly how this will uplift your leaders: “Obey your spiritual leaders and recognize their authority, for they keep watch over your soul without resting since they will have to give an account to God for their work. So it will benefit you when you make their work a pleasure and not a heavy burden” (TPT). Yes, your leaders are normal people! They are not perfect. But, they do have a calling on their lives to lead in whatever capacity God has anointed them...and they have a responsibility to do so in a way that honors the Lord. They will give an account for how they’ve fulfilled their leadership calling, so let’s help lift them up and encourage them by esteeming their position...but giving much grace to them as everyday people too! You’ve probably experienced one or both of these scenarios in your life...at some point, you’ve likely not had enough of something you needed (money, work, transportation, friends, you name it!) and wondered why you weren’t experiencing the abundant and prosperous life you heard others talking about. On the flip side, at some point maybe you’ve experienced a prosperous life, full of blessings and abundance, but felt guilty for doing well...felt like you had to apologize all the time for being blessed. Psalm 103:2-5 says, “Bless the Lord, O my soul, and forget not all His benefits: Who forgives all your iniquities, Who heals all your diseases, Who redeems your life from destruction, Who crowns you with lovingkindness and tender mercies, Who satisfies your mouth with good things, so that your youth is renewed like the eagle’s” (NKJV). And, in John 10:10 Jesus says, “The thief comes only in order to steal and kill and destroy. I came that they may have and enjoy life, and have it in abundance [to the full, till it overflows]” (AMP). Psalm 68:19 says, “Blessed be the Lord, Who daily loads us with benefits…” (NKJV). Seriously, check out the words in that verse: “daily” and “loads!” I don’t know about you, but those words to me paint a picture of abundance, not of scarcity or lack! I know that for some of you, this is confirmation of what you already have experienced as you’ve trusted the Lord for increase and blessings. For others, this is causing your head to go tilt! Let me encourage you today to continue seeking the Lord for revelation in this area...He’s a good Father and He wants you to be super blessed and ever-increasing. It’s all about the heart! God does not want you to be blessed and prosperous so that you become self-obsessed or materialistic. He doesn’t want you looking down on others or letting money rule your life. By no means! He wants you to have and enjoy life, and He wants you blessed to be a blessing! At the same time, the Lord wants you to be content and willing to share generously -- having a giving spirit. Can you see how the heart condition truly means everything in understanding, receiving and appropriately applying God’s goodness and blessings in your life? Take some time this week to soak in these Scriptures...let them renew your mind to what the Word says about God’s heart towards you and His desire for your life. After all, as you experience abundance and are blessed, your ability to bless others greatly increases. So let’s believe God for the blessings He wants for us -- and let’s bless others generously too! 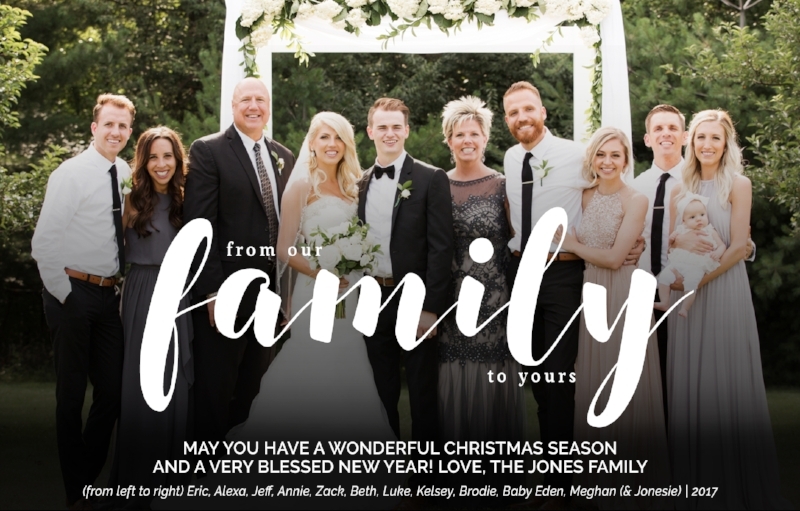 Merry Christmas from the Jones family! Through the Daily Devo, I feel like I get to connect with you all daily...but you may not have met my family yet! So it’s my pleasure to send to you today this Christmas greeting to share my warmest wishes for you & yours to have a very Merry Christmas! 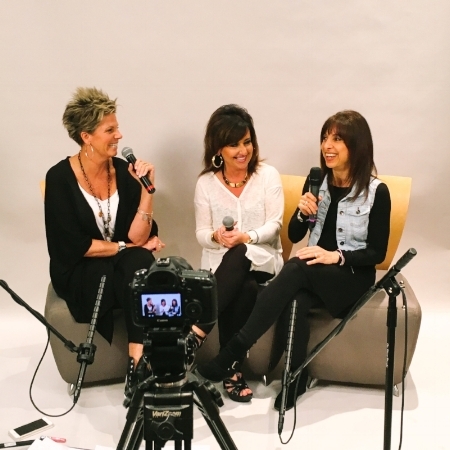 I’m so excited for you to hear from two pretty incredible ladies on the podcast today -- Pam Hart and Gina Cameneti! Pam and her husband Gary pastor Victory Church in Great Falls, Montana, and Gina and her husband Joe pastor Believers Church in Warren, Ohio. Both of these gals have decades of longevity and “stick-to-it-iveness” in ministry, marriage and raising kids! Haven’t you found that people look at you strangely if you say you’ve been pastoring (or fill in your occupation) for 30 years, or been married a few decades -- all while raising up children to love the Lord? Why does that all seem so “out of the norm” in this day-and-age? We tackle that very subject in this week’s brand new basic interview podcast! Pam and Gina dish out their secrets on how to “stay” in a culture that says “go,” how to have longevity in all areas of life -- and how to have fun and laugh along the way! So -- check out The Basics With Beth new podcast today on iTunes or on our website -- and then drop me a note on social media or email to let me know how it helped you! P.S. We’d love for you to subscribe to the podcast on iTunes if you haven't done so yet. That way, you'll get notified every time we release a new episode and be ahead of the curve!